Within Teamwork Projects, you can use your pre-created task list templates to quickly add tasks to task lists in your projects. 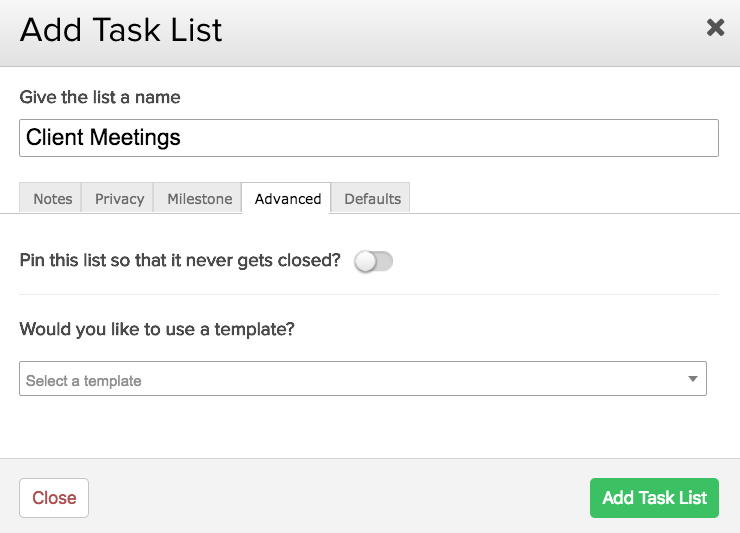 People with the permission to manage task templates can access the templates through the options menu in the Tasks area or via the task list menu next to the task list name. Note: Only site administrators can access the site-level Templates area through the site settings menu in the top right of the screen. To create a new task list from a template, click the green Add Task List button to the top right of the project's Tasks area, then go to the Advanced tab of the task list options. Here, you will see the option to add tasks from an existing template. Select the template you want to use from the templates dropdown, and you will see the tasks within that task list template. The start date selected will affect the due dates of all the tasks in the list, tasks assigned 'day one' will be applied on the date selected as the start date. When skip weekends is applied, all Saturdays and Sundays are removed from the task duration count. This means that only working days (Monday to Friday) are included in calculating the start and end dates for the task. This sends an email notification for the tasks to all the people they have been assigned to. 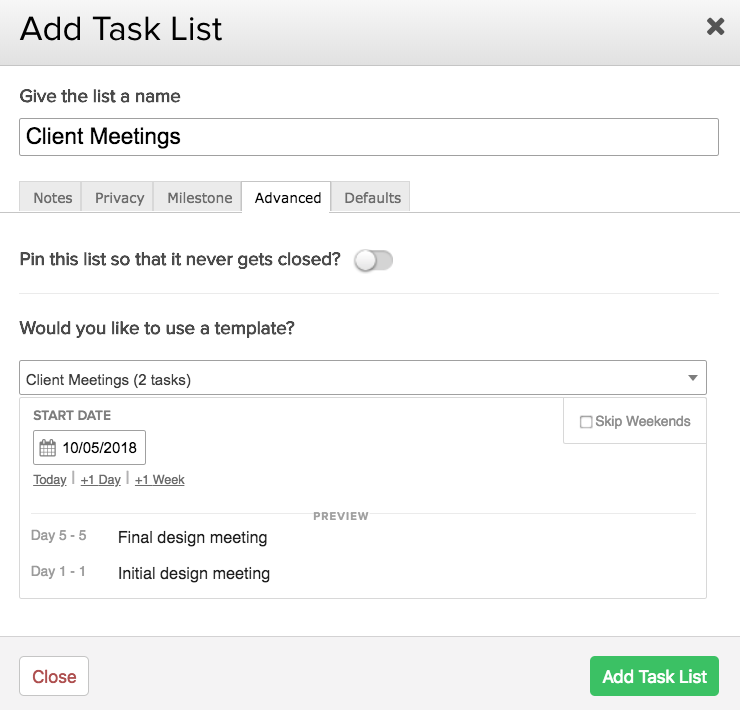 You can also add tasks from a template to an existing task list from within the Tasks area of a project. Click the dropdown to the left of the task list's name, and hover over the Templates option. From here, select the Add Tasks from Template option. The templates available to the user are displayed in the templates dropdown, and you can add them in the same way as in a new task list. Note: The template options at task list level are only available to people with permission to manage task templates.